Education is one of the basic requirement of a human being. It is so important for a person whether its male or female that without having a good education, one can not withstand in this tech world. But as it is so imperative, the same way it is also very tough and extremely difficult to have a good education these days. 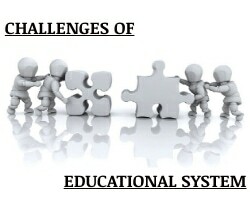 Today in this blog I will discuss some challenges of Education system. for this topic, there must be proper facts, appropriate data, and details which can give us a good piece of information about the topic and a decent snippet of data about the theme. our world on this planet is rapidly developing, every day we have news of new inventions and technology, but on the same side, there are some parts in the same world where there is big lack of even basic facilities. That’s all because of poor administration and low level of education, there can be other factors also, but if we see developed countries today, they are developed because they have a good education system in their countries, on the other place if we see undeveloped countries, they are still picking dust because they have done nothing to improve their education system, its a major fault for them not having a good framework of education, as it is proved that nation with education develops faster than nation without . the above reports states that there is an appreciable improvement in literacy rate in the last 1 century, there is an almost vice-versa in literacy rate and illiteracy rate. major of this literate percentage belongs to developed or developing countries and percent rate for illiterate belongs to poor or undeveloped nations. This report shows us that still there is lots of work to do in the field of education, there are many tasks to fulfilled in order to make every being educated on this planet. UNESCO and other non-profit organization are doing a fabulous job in this field, by creating small study centers, skill centers, night schools, etc where one who is unable to take education or has lost a chance to have good learning in childhood can take education in these centers. They are running so many programmes all over the world to help people educated. If I am saying this as a reason behind this point, one of the very basic cause in the proper administration of education system is corrupt, yes, corrupt official never wants people to be educated, why because if they became educated it will be difficult for them to run their shop of corruption. Corrupt and morbid politicians with dishonest officials are together ruining education system worldwide, as they neither implements good reforms to raise the education rate nor promoting proper programmes to educate every child. As we all know peoples are building blocks of the nation and politicians are the leaders that lead a nation, therefore it’s totally into the hand and control of these leaders where to lead their country. it shows us about the best 5 and worst education systems in the world, as I belongs to Asia(India), its a proud thing for me that 4 countries out of 5 are Asian with the best education system but wait there is another side of coin that is clearly showing that there 4 countries that belong to Asia which have worst or least education systems all over the globe. Its crystal clear view of huge difference in the same continent about education facilities and administration. This supports my words which I wrote at the beginning of this para that because of corruption, there can never be a good education system in a nation. The countries like Japan, South Korea has a good leadership that encourages people to participate, learn and achieve something, Finland has one of the best academic backgrounds in the world, they teach people to learn not to pass the exams, that’s all because they have proper channels to protect education in their respective countries. This is also one of the reasons behind a poor education system, in the absence of basic facilities many children can get a good education. This problem exists in most of the developing or poor countries, where the government is unable to provide good classrooms, books, blackboards and other basic things required. If there are Schools, there is no proper facility of toilets specially for girl students, proper supply of electricity, Drinking water for students, etc. the united nation has initiated so many programmes in several poor nations, to ensure the establishment of good infrastructure for studies and to guarantee the foundation of a good framework for Education. 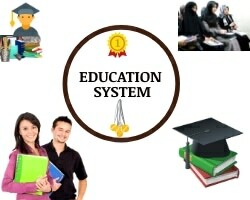 In order to provide a good atmosphere for education, many NGOs and voluntary organizations are also running awareness programmes and camps about the good education system. With the shortage of money and the absence of proper financial resources, it is very difficult to get quality education these days. Many poor nations are unable to provide good education to their children due to the shortage of funds. As they are suffering from other issues also to survive, it’s very extreme for them to provide reasonable academics. Many developed countries have opened their arms to support such countries for the issue of education betterment. world bank also provides financial help for establishing good frames for education to needy nations. Also, some developing countries have applied free basic education to every child up to 14 years in their respective laws, in order to protect every child’s education right. Later on, they also provide scholarships to scholar students for higher students, Educational loans with low-interest rate and also timely financial help to support students from a poor or backward background. This is one of the major challenges for the education system today. Education is the basic right of every human. but due to narrow ideology in many countries ( majorly poor or religious affected countries), many young girls are unable to take even basics of education,they are not allowed to go schools. Due to religious fanaticism, orthodoxy and supremacy of males in society, there is a huge gap between the literacy rate of female over the male. This clearly shows the 8% difference between males and females. Education, especially in backward areas and poor Muslims countries, is banned for the woman, they are not permitted to become educated. There are strong punishments if some woman violates the rules and even sentenced to death. when you visit such places you will scarcely discover a young lady kid sitting in the study hall, infrequently if there are 1 or 2 young lady youngster on every 10 male students. If we look at some case studies, we can see a proportion that there are fewer numbers of teachers required for students. This famine of teacher is a challenge to overcome and provide a good education. There is numerous reason behind this, one of which I have discussed in this article ie. corruption. Many graduated who want to be a teacher are unable to have a good teaching job, recruitment processes are so long and complex that eligible candidates are either quitting the idea to become a teacher or heading to another career option. it’s one of the reasons that in schools teacher have to give lectures to 50-100 kids at the same time, there are pending vacancies and vacuum spots for teachers, but no one is there for the students. Untrained and uneligible teachers are also a problem for the education system. Teachers are nation makers as they modify a child with principles of life. But with the absence of a trained tutor, they are unable to get good educational stuff. With the entrance of private sectors in education has also created a threat to good education, as big corporate only want their business to boost, they are not at all interested in the enhancement of a child’s future by providing good and quality education. High school fees, other charges are creating a burden on parents pocket for which most of them try to find out a cheaper school with affordable fees rather than trying to get a decent institute with a good academic background. Many higher institutes increase their fee structure at timely intervals and in the name of cultural activities they ask for another amount, in short money and money. This new business of education is dropping down the level of education. There must be interference of government in the matter, applying strict rules and regulations for schools and other institutes to remove such stubborn of them. To overcome these challenges, the world community has to be together, educational reforms are required, mutual help in any mode for betterment and enhancement of the education system is required.